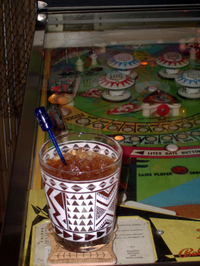 As I mentioned in my previous post, Don the Beachcomber's cocktails were notable for their use of secret mixes which typically consisted of simple syrups or fruit juices combined with whole spices like cinnamon or vanilla. Since I still had a sizable amount of Don's Mix #2 (grapefruit juice and cinnamon syrup) left in the bar fridge after my Zombie experiment, I decided to look for some other recipes in Sippin' Safari, so I could use it all up before it spoiled. I found one other drink that called for it explicitly, Donga Punch, a rather simple concoction of lime juice, mix, and aged Martinique rum. Unlike many of Don's recipes which call for a blender, this one required my trusty cocktail shaker. Since I don't own any Beachcomber mugs, I poured it into one of my favorites, this female (rather masculine looking, actually) Kahlua Hut mug I picked up last year in Virginia. The result was drinkable but definitely far less complex than the Zombie. On the nose, you get the cinnamon aroma of the mix, but the St. James Martinique rum I used lent it a rather harsh aftertaste, which combined with the tartness of the grapefruit and lime juice, made for an unbalanced and somewhat unsatisfying drink. 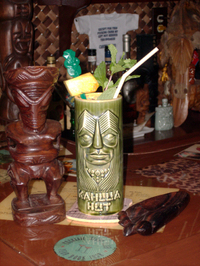 Next, I decided to make a Jet Pilot, probably my favorite drink from Sippin' Safari. The recipe calls for both grapefruit juice and cinnamon syrup, although not in the same proportions as what was contained in the mix, but it was close enough. To the ounce of mix, I added fresh lime juice, a clove/ginger/allspice syrup called Falernum (I used Fee Bros.), Angostura bitters, and a few more drops of Absinthe, along with 3 rums: Puerto Rican gold, Jamaican dark, and Demerara 151. Actually, I didn't have any Jamaican lying around, so I used Cruzan Black Strap, which has a strong molasses flavor. In retrospect, I probably should've cut back on the the Cruzan a bit, since it tended to overpower the more delicate flavors, but the Falernum and a bit of the anise flavor of the Absinthe managed to peek through.